Does tongue tie cause mouth breathing in children? Hyperventilation means over-breathing, specifically to the point where the body’s carbon dioxide (CO2) levels become too low. Hyperventilation can be an acute response to a particular situation or it can become a chronic and habitual way of breathing. An accurate diagnosis of hyperventilation is only possible using an instrument called a capnometer, which measures the amount of CO2 in exhaled air. Hyperventilation is a common type of dysfunctional breathing. It can affect 10% of otherwise healthy people and up to 70% of people with anxiety disorders. It is also frequently found in people with asthma and other chronic illnesses. Low CO2 levels and low bicarbonate, resulting from habitual hyperventilation, can affect the body’s ability to regulate its pH, reduce blood flow to muscles and organs and interfere with cellular oxygen uptake. Low CO2 can also lead to irritability of nerves, constriction of smooth muscle, impaired enzyme activity, inefficient cellular metabolism and increased mineral excretion by the kidneys. Individuals are predisposed to hyperventilate for psychological and physiological reasons and in response to diseases of the respiratory, cardiovascular and nervous systems. What are the symptoms of hyperventilation? The classic symptoms of hyperventilation are numbness and tingling in different parts of the body, dizziness, brain fog and muscle tightness. Many other symptoms such as chest tightness and pain, irregular heart rhythm, breathlessness, anxiety, panic feelings and fatigue can also be present and form part of the diagnostic picture. 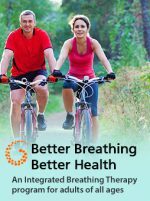 Research has shown that the process of resetting the brain’s breathing control mechanisms to correct hyperventilation takes time and persistence. It’s also important to look at underlying causes and contributing factors, and correct these as much as possible. 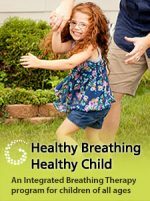 These programs are designed to correct hyperventilation as well as other associated types of dysfunctional breathing in adults/children. To make an appointment or other booking please visit the BOOKINGS page. Please feel free to contact me with any questions about how the treatments could help you or your child.